First and foremost, BIG HUGE THANKS to the sweetheart-ed souls who came out in the cold and rain to shop my garage sale. Drizzle aside, seeing familiar faces (and meeting some of you for the first time!) brought a whole bunch of sunshine to an overall cloudy day. As luck would have it, today the skies are blue and the sun’s shining down. Which is A-OK with me, because I’m going to see Shooter Jennings and Waymore’s Outlaws play outside tonight, and I’m pretty sure I’d cry if I had to spend another minute in the rain. While I’m not a fan of Shooter’s original music, I am looking forward to seeing his backing band, comprised of Richie Albright, Waylon’s original drummer and right-hand man since 1964, FAME studio session bassist, Jerry Bridges, who played with Waylon starting in the “Dukes of Hazzard” days and steel guitar legend Fred Newell. I’m extra-excited because it’s the first outdoor concert I’ve been to you yet this year, I have the perfect dress to wear and…have I mentioned that’s it’s not raining? Whatever you’re up to this Sunday, enjoy yourselves! Rain or shine, summer weekends are gifts to be treasured. Photo c/o: King of Beers. 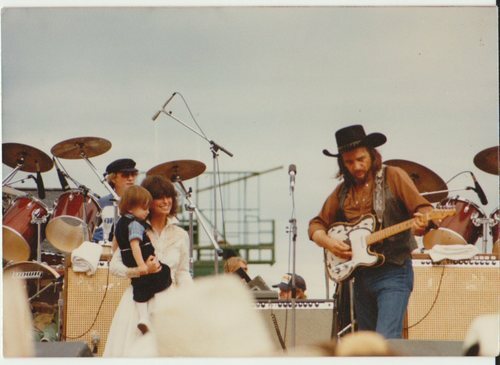 This entry was posted in personal and tagged music, st. cloud, waylon by highplainsthrifter. Bookmark the permalink.